The All New, All Daring Delusional Honesty! : Incredible Hulks #613: A Little Less Conversation, A Little More Action...Please? Incredible Hulks #613: A Little Less Conversation, A Little More Action...Please? Well, I've had enough time to sit and digest the book in question, and soon enough I'll be mailing out another Daily P.O.P. exclusive interview, but for now, you lucky ducks get my review for parts 3 and 4 of "Dark Son" in Incredible Hulks #613! I guess I shouldn't have gotten my hopes up. That was my first thought when I finished this issue--or, at least, the "K'ai" segment of this issue. The rest, well, that's what you're here for, isn't it? After last issue, the Worldmind found it just couldn't take Hiro-Kala's whining any longer, attacking him deep inside the planet K'ai. Meanwhile, the newly-resurrected Betty Ross made it clear she didn't want to be married to Bruce...but what does the Hulk have to say about it? This issue thankfully keeps the positive momentum going, following up on both of these key plot points. Some efforts are more successful than others. Firstly, it's a credit to the editors, or whoever made the decision to put the "K'ai" section of this issue ahead of the "Earth" section. It serves as a reminder that for this arc, the K'ai stories are not mere "back-up" tales, but vital pieces of the story being told. However, where at first I was enthusiastic about the ramp-up to Hiro-Kala's arrival in our solar system, it appears this saga has very quickly degenerated into another contest of "How badass can we make the bad guy who still had a shred of sympathy going for him?" Here, writers Pak and Reed make it clear there is no going back, that Hiro-Kala is irredeemably evil, and we can ignore all the times he's been framed to be the misunderstood good guy who's doing the right thing no matter what everyone else thinks. On the one hand, I suppose it's fitting that the Hulk has one son who is unremittingly evil, in the way Brian Banner thought young Bruce was, because it's just not a good plan to run the same plot twice (the first with Skaar). On the other hand, Hiro-Kala's characterization and deeds are just so over the top as to be cartoonish. Really, I'm just relieved this separate section of the stories is over, and that Hiro-Kala's collision course with the Hulks will be folded into the regular stories next issue. By great contrast, the "Earth" story in the back of this issue picks up wonderfully from the last issue, advancing the narrative on all points. Last month, we found out where Bruce and Betty stood in their tumultuous relationship; this month, Greg Pak mines the territory of Hulk and Red She-Hulk. You know it's going to be fun when our first glimpse of Hulk has him telling someone else to calm down! In some ways this encounter is just what you'd expect, and in some ways it's even stranger. The narrative also mines the Hulk's own characterization, and does it very well. 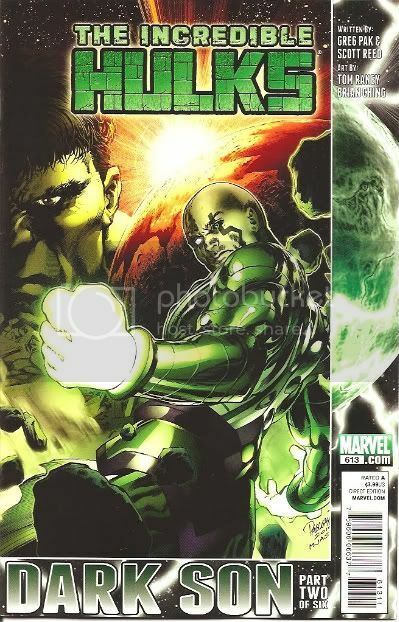 Although much speculation followed the final effort by Jeph Loeb in Hulk #24 as to which incarnation we'd be dealing with herein, I think the question is safely settled here: we are indeed dealing with the "Gravage" Hulk, the Green Scar, the version seen throughout "Planet Hulk" and World War Hulk. Let's face it: Banner could never carry off calling people "stupid" well, and rarely is as curt as this Hulk. This Hulk has something to live for, and although some would argue it takes away a certain edge to the character, I should remind those fans we've got four whole issues left to this super-saga. Of course, there must be more to this saga than pure characterization and setup, and it starts to move forward here, first with a very Silver Age-y opening to this chapter that evokes the ridiculousness of the 50s-era Superman tales. It ramps up again at the end of the issue, with an offer courtesy Steve Rogers and Amadeus Cho that pertains to said opening. The Hulk's reaction to their news and offer fits right in his character in light of the last few years' worth of events, and is only outdone by that other shoe dropping, courtesy of his son Skaar. The last page is instantly classic, and leads us squarely into next issue. All in all, this is a decent package, but I'd be afraid those more casual fans reading from the front on back might be bored rather quickly at the Hiro-Kala chapter. Venturing beyond the staples increases one's enjoyment considerably. The artwork by Brian Ching in the first half is brilliantly moody and dark (which fits a storyline called "Dark Son") which contrasts greatly with the bright colors and almost "feelgood" vibe that Tom Raney sets forth in the second. That said, as much as I'm enjoying Raney and Ching, I'm quite anxious to see Barry Kitson take the reins in next month's issues, and I'm confident that Kitson will bring his "A"-game as the story itself elevates to the next level. Hulks in space? It looks like we're going to get more than our fill these next few months! Thankfully, the "Earth" stories in these last two issues of The Incredible Hulks have made it clear, we're in for a rollickin' ride, at least as far as the complex relationships between our protagonists! Another great interview Gary, the only point that I disagree with is that Hiro Kala is the first child of Bruce's to go bad. He isn't. Bruce's third son is now the new 'evil' third Maestro. While Bruce's alleged second daughter the 'new' Scorpion will start to follow in the 'original' Scorpion's footsteps and be Spider-Man's punching bag. Though I suppose with Marvel's sliding timescale it is next to impossible to know what story comes first. PS When did you interview Jeff Parker? Was it at a Comic Con? Also, when will you be interviewing Greg Pak? I assume he is the next Hulk writer on your list? Great review, and I agree on all points. I couldn't help but notice how the Hulk wasn't flying into a rage whenever he was addressed as "Bruce" or "Banner", even though Greg Pak has now firmly established that this is indeed "Gravage" we're looking at, and not another version of Banner-Hulk. At the very least, it seems Bruce and the Hulk have formed some kind of truce for the time being. Red She-Hulk is becoming more intriguing with each issue. When Doc Samson first created the Merged Hulk way back in the day, Betty felt alienated and driven away from what she felt was arrogance on the Bruce's part. Of course, that's all changed now. Betty has become Bruce's equal (or near equal) in monsterhood. The multi-layered relationship between Bruce and Betty, and Hulk and Red She-Hulk, is one aspect of the book I'm most anxious to see unfold.